Need to find a pet friendly hotel in North Charleston SC? Click the Pet Friendly Accommodations Button below! Traveling with your pet whether it is a dog, cat or even a bird will make your vacation more enjoyable. On this city page, and thousands more for nearly every city in the World, you will find everything you need from pet friendly accommodations to the services that will make your trip more enjoyable. Find nearly 57,000 pet friendly hotels and accommodations in 5,000 cities around the world where your pet is welcome. 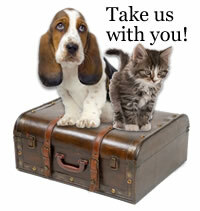 It's easy to find dog or cat pet friendly hotels in North Charleston with PetTravel.com. Click the SEARCH PET FRIENDLY ACCOMMODATIONS button above for a list of pet friendly hotels, motels, bed and breakfasts, small inns, and vacation rentals in North Charleston. You can even book your reservations on the same page!